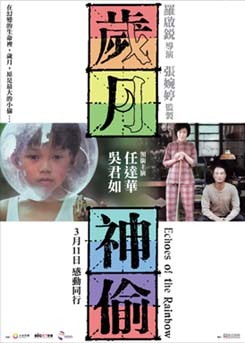 The film depicts Hong Kong in the striving 60s, as seen through the eyes of a child. Nosy, naughty and always running into trouble, the kid observes with wit and humor the ever changing society of Hong Kong. The story revolves around the kid and his family - a working class father, a happy-go-lucky mother, an aspiring, starry-eyed elder brother, and our young protagonist himself. Through the elder brother's first romance, and the family's encounters with love, hope, failure, death and rebirth, we travel back to a place called old Hong Kong, a time we'll always remember, and a place we have always called home. david Nov 27 2010 12:12 am I am touched with many scenes in this movie. This is a great movie. edmund Aug 27 2010 3:54 pm I like the movie very much because it also reflects the life of our family in the old Iloilo, Philippines in the 60's. The movie is so reflective.